We are pleased to introduce a new series of Cases for the Texas Instruments line of Products. A new Modular case that has interchangeable trays to hold any combination of calcs you wish. Trays hold 10 calculators of any size, Or 20 -TI Nspire keyboards. All are numbered and covered with soft fabric. Outer case is covered in Denure and has a handle and shoulder strap as well as 3 document holders. May be ordered with wheels and pull out handle. Several other styles to hold the Nspire line of calculators are available as well as the original TI 84 SERIES of cases still in stock. The Navigator system has its own inexpensive case now also Holds 2 teachers packs and 1 student pack in a lift out tray. Version 1 and 2 (NSPIRE must be custom fit). 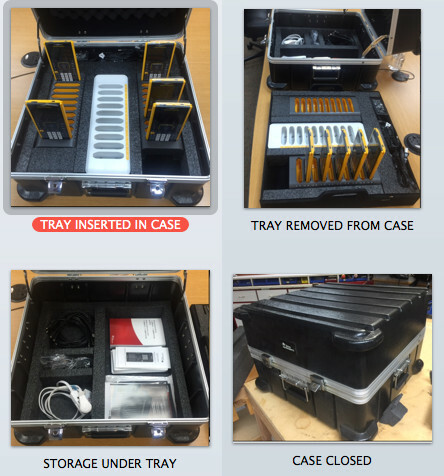 Case is rugged ATR rated, Foam lined, with foam lined wood tray and steel lockable latches and hinges. All NSPIRE CX CAS calculators will fit comfortably in all NSPIRE designed cases. All 84 cases will hold 83 series. 30 graphing calculators stored in racks. All books,	cords and peripherals, are stored under charging tray. 3 charger adapters, which can be used in tray, in or out of the case. Using	the Navigator system it will also hold WIFI and network adapters. It has built in Locks in the steel latches for added security and chargers can be used in or out of case. Case may be ordered with or without wheels and Pull out handle. We have a series of cases that are modular, in that they will have removable trays to exchange for other size calculators, if you wish. Will hold 2 trays, 20 NSpire calc. Size, 10 per tray numbered 1-20 and 1 tray with 20 keyboards numbered. Each one will have the option of wheels and handle also, just add a /W. For wheels and handle add $20.00. These cases will be hard lined trays covered in soft fabric, the case will be a hard shell covered in Denure with handle and shoulder strap. It has 3 large document pockets on the front. Size: 32" x 17" x 5-1/2"
Docks can be left in case for charging. Has lift out tray all foam lined. Version 1 and 2 (NSPIRE must be custom fit). Single zippered soft lined case for one NSPIRE calculator. Pouch to hold an extra keyboard, and business card holder in cover. Made in heavy weight Denure fabric, with soft foam to hold calculator. Much more substantial than the regular foam cells. Also available with the handle and wheel option. New improved design typical case with handles and wheels shown. Hard case. 12HP holds 12 TI-83, TI-84 and INSPIRE series. Hard case. 30HPN-84/T holds 30 TI-83 and TI-84 series with projection unit in tray. Hard case. 30HPH-84 holds 30 TI-83 series and TI-84. Holds 5 CBL's, 5 Calculators & Probes. Holds 5 CBL 2's, 5 Calculators & Probes. Hard case, holds 16 Keyboards, 1 View Screen, 1 Book, 1 TI 83 in cradle, and 1 Adapter. Hard case, holds 20 Voyagers, 1 View Screen, and 1 Adapter. Hard case, holds 10 Voyagers. Hard case, holds 15 TI 83+'s in cradles. Hard case, holds view screen, adapter, tray with keyboard, 83 in cradle and TI 83+ or TI 92. Hard case. 22 INS - / Holds 22 TI Inspire calculators / 2 per cell. Hard case. 12 INS - / Holds 12-Inspire Cass Calculators. 19-3/4" x 12-1/2" x 6-1/2"
New wheeled 30 pack carry case for TI Nspire calculators and Keyboards. Soft pockets numbered from 1 to 30, zipper pouch on front for literature. Covered in heavy Denure with shoulder strap, pull out handle and wheels. Wheeled 30 pack carry case for TI NSPIRE calculators. Includes 4" storage compartment with hinged cover. Will hold 2 NSPIRE charger racks. All pockets numbered from 1 to 30. Large pouch on front of case to hold documents or cables. Large case to hold 30 NSpires and 30 keyboards, with wheels and handle. Rigid zipper lined case with EVA molded lid and soft foam cells for maximum protection. All cells numbered from 1 to 30. Holds NSPIRE calculators or NSPIRE CX with 30 keyboards. Will also hold any TI 84 series. Made in heavy wt Denure with shoulder strap. Soft hanging case designed to hold 30 TI 84 series calculators in individual pockets. All numbered from 1 to 30. Folds and secures with zipper. Has door hanger on hook, handle, shoulder strap and large pouch on front for manuals. Made from heavy weight denure fabric. 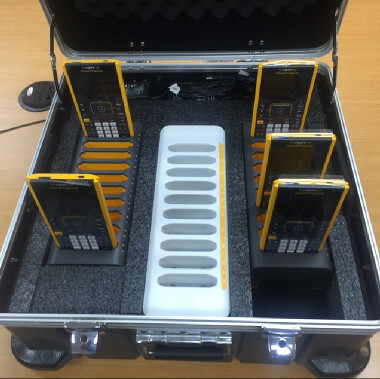 Soft hanging case designed to hold 30 NSPIRE series, as well as other large calcs, ie: school bus yellow and TI 84 silver. Calculators in individual pockets. All numbered from 1 to 30. Folds and secures with zipper. Has door hanger hook, handle, shoulder strap and large pouch on front for manuals. Made from heavy wt. denure fabric. Includes shoulder strap.